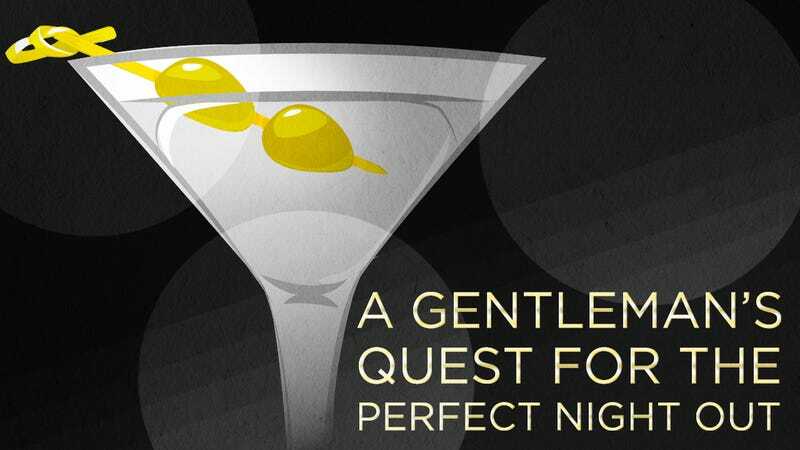 Welcome to A Gentleman's Quest for the Perfect Night Out, a four-part guide written by etiquette expert John Bridges meant to instruct our more testosteroney readers on how to comport themselves during the evening hours. With the help of Clear Men Scalp Therapy, which gives you 100% dandruff protection* (because, after all, perfect hair ensures a perfect night), the guide covers all the man-questions you were always curious about, but were too ashamed to ask your dad. Don't worry. This is a safe space. The perfect cocktail is simplicity itself. It does not require a blender, a jigger, a muddler, or a tiny paper parasol. What it does require is a chilled glass, a couple of fistfuls of good-quality (that is, unclouded) ice cubes, and a steady hand. At least that is the way an evening of perfect cocktails should start. Provided there is more than one glass still chilling, and there is a back-up bag of ice cubes in the freezer, after the first round – not to mention the second one — the steady hand may seem less necessary. A "cocktail" is a drink that includes at least two different kinds of liquor. If a mixer, such as seltzer or tonic water, gets involved, it becomes a "highball." If anything else gets involved, you might as well call it "punch" and serve it to your Nana. The One True Cocktail, beyond any plausible argument, is the Martini — which, correctly, is capitalized, since it probably started out as the name of a bartender or was stolen from the label on a vermouth bottle. If it is true to its calling, it will be made with about 2 ½ ounces of gin, although, since gin requires a rather sturdy constitution, vodka works too. And it must contain a dribble of French, aka "dry," vermouth. No matter what anybody says, if there's no vermouth in the glass, it's just a glass of gin — or vodka, if you must. It's a simple matter of chemistry. Ian Fleming notwithstanding, the choice to shake or stir is nobody's business but one's own. Let it be noted, however, that the overly vigorous agitation of a cocktail shaker, as opposed to a calm and patient stirring, is much more likely to "bruise" the hooch. Hence, Mr. Bond's stern warning. Perfection can be achieved with a Manhattan, especially if it's made with rye, which is the best reason known to man for being trapped in a bar, in a city you don't know, on a drizzly afternoon, just on the edge of twilight. A Cosmopolitan is much less demanding, but its rewards are also fewer. It is difficult to imagine anyone actually savoring a drink that is pink. The same goes for any drink that is made with whipping cream, much less, half-and-half. Any drink that is worth making, after all, is a drink that asks you to linger with it. No matter what happens tomorrow, it is memorable for the moment. If all goes well, you may truly be able to convince yourself that you will never meet its like again. But, if life is kind, you will. Etiquette expert John Bridges is the author of How to Be a Gentleman, and is also the coauthor, with Bryan Curtis, of seven other volumes in the best-selling GentleManners series. He is a frequent guest on television and radio news programs, always championing gentlemanly behavior in modern society. Head here to learn how you can stop dandruff at the source* with new Clear Men Scalp Therapy and be on your way toward your quest for perfection.